On the battlefield, the fate of the injured often rests in the hands of the first responder. The importance of knowing what to do, how to do it, and when to do it cannot be overstated. 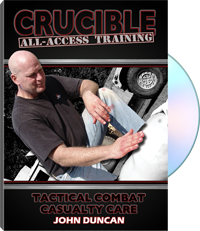 In Volume 5 of the Crucible All-Access Training series, Crucible's John Duncan teaches the basic guidelines, methods, and principles of tactical combat casualty care. Using battle-tested training methods and state-of-the-art equipment, Duncan's instruction includes packing wounds, treating sucking chest wounds, clearing airways, and applying tourniquets properly. This video demonstrates the best possible combination of good medicine and good tactics. Combat casualty care is critical not only for the survival of the wounded, but also the survival of the other team members and the overall success of the mission. Be prepared for medical emergencies with the real-world, hands-on instruction found in Tactical Combat Casualty Care. For information purposes only. A combat veteran, John Duncan served 23 years as a corpsman in the U.S. Navy. He has been with Crucible for five years, where he is the senior medic and lead instructor for tactical combat casualty care.